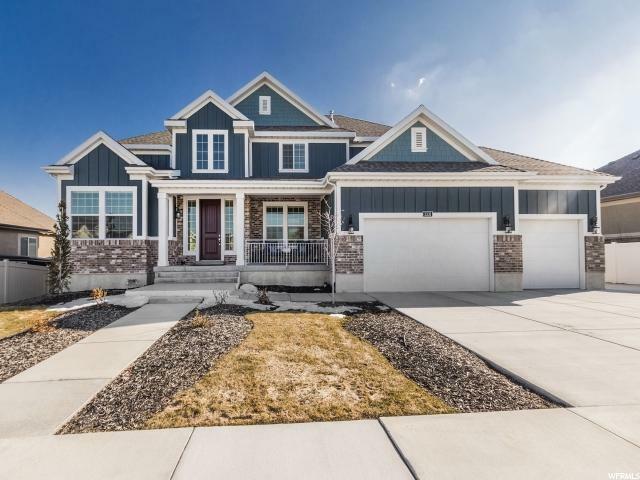 All IVORY CROSSING 1103 homes currently listed for sale in South Jordan as of 04/25/2019 are shown below. You can change the search criteria at any time by pressing the 'Change Search' button below. "Absolutely Spectacular!! Located in highly sought after Ivory Crossing w/ incredible mountain & valley views! This impressive Hanover Plan boasts a gorgeous chef's kitchen, granite counters, white maple cabinets w/ quiet close drawers & pull-outs, dbl ovens, butlers pantry, tile back splash, farmhouse sink, stainless steel gas appliances & huge island for entertaining. Family room warming gas fireplace. Timeless hardwood flooring. Soaring cathedral & 9' clngs. Formal dining & living/ office areas w/ French doors. Plantation shutters in living room. Main floor bedroom w/ full bath. Mudroom bench & lockers. 8' tall interior doors. Beautiful staircase to catwalk overlook. Grand master suite w/ amazing views, adult height vanity, dbl sinks, walk-in closet, large European shower & soothing 5' jetted tub. 2 laundry rooms. Custom finished basement w/ kitchenette & laundry (no stove). Laminate flooring, 9' clngs, spacious family room (wired for surround sound) & fun kids play area under the stairs. Walk out kitchen to incredible mountain views w/ huge patio & shaded pergola for relaxing in the evening. Covered front porch & RV parking. Immaculate inside & out! Amazing community & amenities. Just minutes to neighborhood pool & kiddie pool, clubhouse & parks. Enjoy shopping & entertainment at The District. You will love coming home! "